I am all for referees having greater powers in a bid to command respect from footballing prima donnas, but I can’t see this method getting adopted globally any time soon. 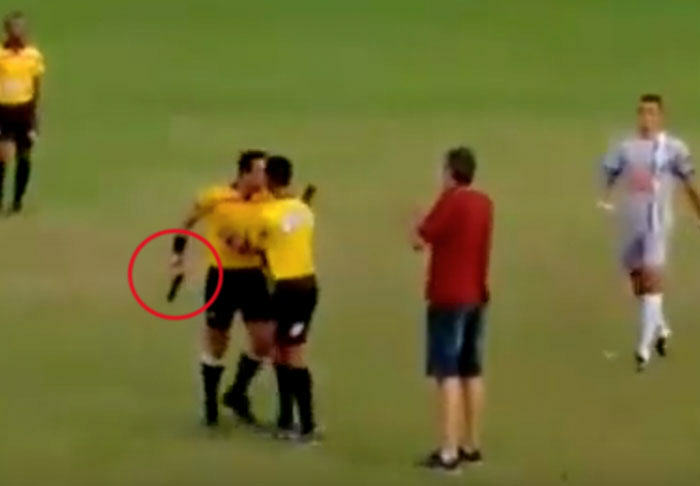 A referee in the Brazilian town of Belo Horizonte, who was believed to have been kicked by a player, headed for the tunnel only to return with his handgun. Gabriel Murta had allegedly failed to award a penalty or red card after an incident, met with anger by one set of players. Murta, employed as a police officer, then resorted to a tried and tested method from his day job to make his point. Giuliano Bozzano of the Minas Gerais Football Federation and the National Association of Football Referees has suggested the consequences are being carefully considered. The Minais Gerais Football Federation has already summonsed the referee and a psychologist to a meeting and I’m going to talk with him today. On the basis of that conversation and his account of events and the results of the psychological assessment I’ll decide what if any measures to take. What’s happened is obviously not a common occurrence and I don’t want to rush into anything. Psychological assessment is a must purely for the sake of Murta’s health, but the writing has to be on the wall as far as his refereeing career goes?